The following shall provide you with the knowledge needed to make nice texts or letters which seem to be pressed in or coming out of the screen. I will describe some standard steps you always take to achieve this effect. After that we will lift the letter from the bottom and give it a shadow. 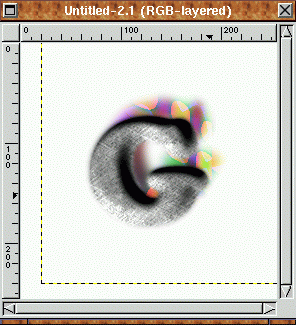 This tutorial was created using The Gimp 1.0 on a SuSE 5.3 system. Obviously it was written a long time ago, nevertheless the mechanism still works. First lets create a new image, say of size 256x256 with a white background and open the layers menu. 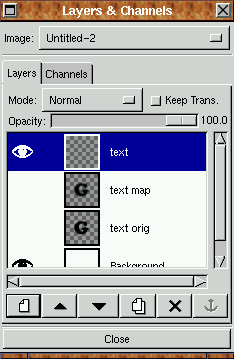 Create a new transparent layer by hitting C-n in the layers dialog. 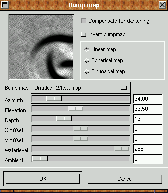 Name it "text orig". Now create a letter. This can be done in various ways. On the one hand you could have some nice fonts installed or more than that you are running a XWindowsystem with a truetype font renderer. On the other hand you could create your own letter using the very important and usefull bezier-select tool. If this is your way you should make sure you got a Gimp version newer than the 1.0 used here, because in newer version you are able to manipulate the paths later. This can save you LOTS of work and time! (I know what I'm talking about ;-). 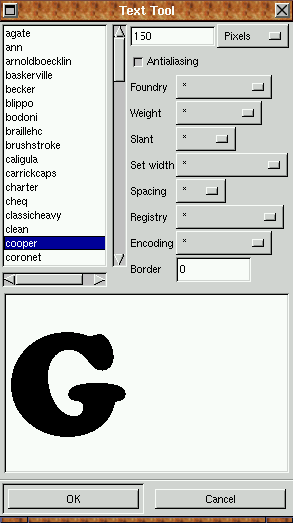 Here I use the text tool ;and create a capital G in the cooper font I got from installing the freefonts packet (you can find that on the Gimp site in ressources-fonts). I set the size to 150 which works just fine with scalable fonts. Move the appearing floating selection to approximately the center of the image and anchor it by clicking with the mouse when the cursor shows an arrow pointing downwards or by hitting the anchor symbol in the layers dialog. Now duplicate this layer and name it "text map" by doubleclicking on the layers name in the layers window. 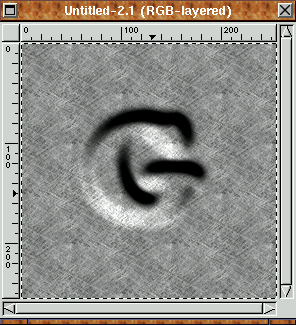 Now we make a map from the layer named "text map" by selecting it in the layers window and then use Filters->Blur->Gaussian Blur (IIR) at a radius of 15. 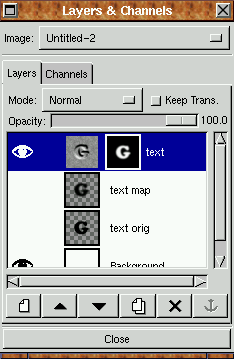 After that we make the text layers invisible by unclicking the eye-symbol in the layers dialog. The last step in this phase is the creation of a new layer (just like above) which we name just "text" because this will be the layer which contains the finished text. We will now fill this new layer with a pattern. At this stage you could take a different path by using the original text layer but I take a longer way because we will encounter layer masks and the power of the levels tool there. OK, select all (C-a) in the (activated!) final text layer called "text". You know you selected all when there is a frame of marching ants around the borders of the image. Doubleclick the bucketfill tool in the toolbox (which is the window which appears when you first start the Gimp). This brings up the options of each tool so that we can now select "Pattern Fill". Which pattern to use is selected in the pattern selection which can be accessed via Sh-C-P or in the dialogs menu. 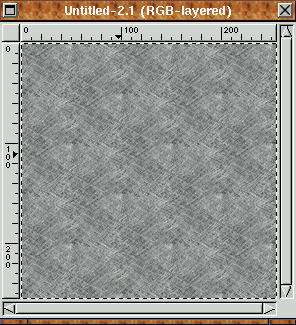 Choose the grey Paper (100x100) there which makes a nice texture which doesn't disturb too much. No click in the image to fill the layer. Now we leave the stage of preparation and et to the hot stuff. 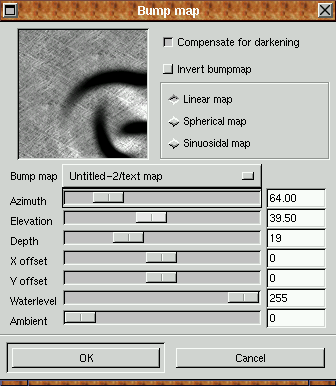 We now select the paperfilled layer and open the Bumpmap filter: Filters->Map->Bump Map. There we choose the layer "text map" as the bump map, toggle "Compensate for darkening" which is always a good choice if you already got a texture in the layer in which you bump another. If you use a simple white layer for bumping you may wish to leave this switched off. Then fiddle around with the settings. 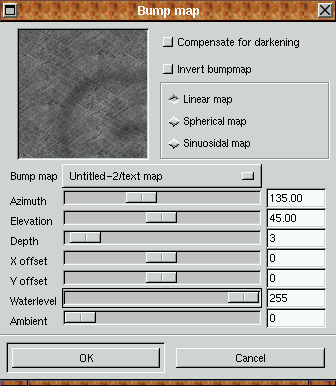 First of all set the Waterlevel to a higher value, then place the lightsource by changing the azimuth. If the letter is not visible in the little preview pane you can move the preview-viewport by dragging with the left mouse button (why did it took me almost a year to find this out?). 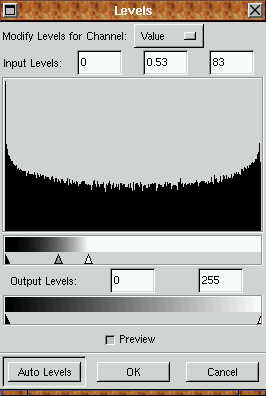 You can probably guess what the "depth" parameter does. 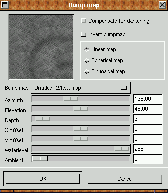 What we have done now was using the greyvalues of the blurred letter as height information. 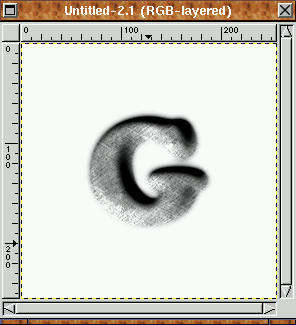 OK, now we got this huge G with lots of grey paper around it. Actually we just want the G so we need to cut the surroundings away. Therefor we rightclick in the layers dialog and choose "Add Layer Mask" with "white (Full Opacity)" toggled. Then there appears a second little picture in the layers preview right beside the actual image. This is the mask in which white parts define the parts of the layer that are visible whereas the black parts will be cut, grey will be something inbetween. Now we activate the "text map" layer, select all with C-a, put it into the copy-ring (C-c) and paste it into the mask (C-v in the mask; make sure you don't activate the image!). Just anchor the floating selection. Now open the Levels dialog which rests in Image->Colors->Level. Play around with the arrows and watch the result in the image. 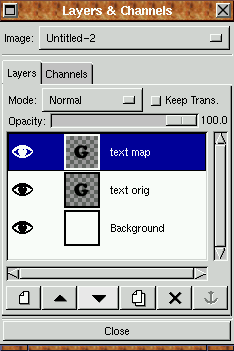 Choose a setting so that you like the remaining parts of the original layer and apply the layer's mask by choosing that options in the layers dialog's rightclick menu. Well, well, as a matter of fact I don't like the result very much. I chose a azimuth in the bump map dialog which now places the drop shadow in a way that somewhat disturbs the 3D effect. So I could easily toy around a little bit. I toggle the "Keep Trans." switch in the layers window to on and activate the shadow/map layer (you could rename it to "text shadow" if you like). 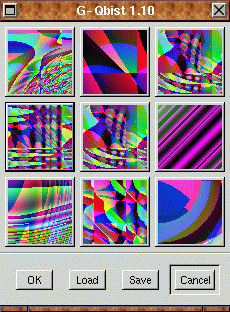 Then I open the Qbist: Filters->Render->Qbist. 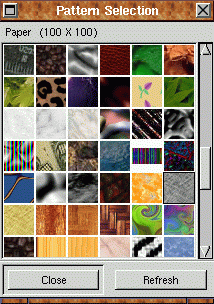 You get a 3x3 field of patterns. Each time you click one of them it goes to the center and 8 new are derived from it. Play around till you find a nice one. You could choose to fill the background with black, because in that case the colored shadow may look even better.